Volvo Trucks is exhibiting two high-specification, construction-focused vehicles from the payload-friendly FM Series in Hall M at the Tip-Ex 2017 Show (1st–3rd June 2017) at the Harrogate Convention Centre. Both trucks are finished in a striking orange livery. The two trucks, an FM 8x4 Tipper Grab fitted with the latest Euro-6 Step-C, D13K500 13-litre engine, rated at 500hp (368kW) and an FM 6x2 tractor equipped with the recently introduced, factory-fitted Lite Pusher Axle and Euro-6 Step-C, D11K450 11-litre power plant rated at 450hp (332Kw). 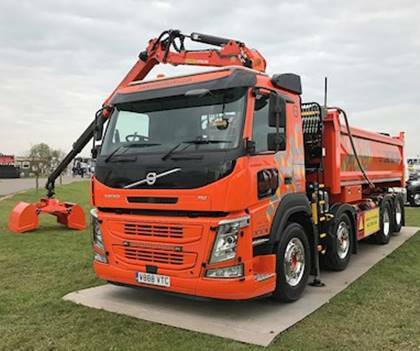 The 5100mm wheelbase FM 8x4 Tipper Grab is fitted with air-suspension on all four axles as well as Volvo's Tandem Axle Lift - which enables the double-drive to be temporarily disengaged, so becoming a single-drive Tag-Axle 8x2 for use when manoeuvring off-road and unladen - thus saving tyre wear and fuel. Aimed at road transport operations requiring optimum payload, such as artic bulk tankers and tippers, and a class-leading driver experience, the Globetrotter-cabbed, FM Lite Pusher three-axle tractor unit fitted with the 11-litre engine, delivering a substantial reduction in unladen weight compared to a similarly specified, conventional 13-litre powered Pusher Axle tractor - without compromising torque (2150 Nm between 1000 and 1400 rpm) or fuel efficiency. Axle ratings on both trucks deliver the optimum loading tolerance for their respective specifications. The 3800mm wheelbase FM Lite Pusher Axle has been specified with an 8000kg front axle and the Lite Pusher axle itself is rated at 4500kg with the drive axle at 11500kg. The front steer axles of the Medium Day-Cab FM 8x4 Tipper Grab are rated at 18000kg and the double-drive bogie at 21000kg. The FM 8x4 Tipper Grab chassis can be specified with either an 11 or 13-litre engine rated from 330 to 500hp and is available with a window in the lower nearside door for urban work. Specification of the 5100mm wheelbase, fully-air suspended FM 8x4, has been designed for efficiency and maximum manoeuvrability when working in the urban environment. I-Shift automated gearbox and Volvo Dynamic Steering are included, as is Tandem Axle Lift, which reduces tyre and component wear when unladen. A forward facing camera is also mounted under the sun visor. Both trucks are equipped with Volvo Dynamic Steering, which reduces steering effort by up to 85%, plus the full list of Volvo's Active Safety+ option package for drivers. Features fitted include Lane Change and Lane Keeping Support, Electronic Stability Program, Forward Collision Warning and Driver Alert Support. The Lite Pusher Axle tractor unit is also fitted with Adaptive Cruise Control. Both trucks are fitted with the class-leading AT2612E I-Shift 12-speed automated gearbox. In fact, with less than 5% of customers opting for a manual transmission nowadays, Volvo are saying ‘goodbye' to the synchromesh manual gearbox this year, as I-Shift has become the gearbox of choice. Volvo Trucks and Sister Company Volvo Construction Equipment offer a wide range of highly productive, low emission, driver-friendly, fuel efficient trucks, for on and off-road operation, to all sizes of construction, mining and quarrying companies. Operators of Volvo Trucks construction vehicles in the UK can take advantage of the extensive product range and gross operating weights that now extend from 10 to 180 tonnes under STGO CAT3 rules.